This is a list of destroyers of the United States Navy, sorted by hull number. It includes all of the series DD, DL, DDG, DLG, and DLGN. CG-47 Ticonderoga and CG-48 Yorktown were approved as destroyers (DDG-47 and DDG-48) and redesignated cruisers before being laid down; it is uncertain whether CG-49 Vincennes and CG-50 Valley Forge were ever authorized as destroyers by the United States Congress (though the fact that the DDG sequence resumes with DDG-51 Arleigh Burke argues that they were). See also List of destroyer classes of the United States Navy. For destroyer escorts, see List of destroyer escorts of the United States Navy, and for destroyer minelayers, see List of mine warfare vessels of the United States Navy. The DL category was established in 1951, with the abolition of the CLK category. CLK 1 became DL 1 and DDs 927–930 became DLs 2–5. By the mid-1950s the term destroyer leader had been dropped in favor of frigate. The DLG sequence was deactivated in the 1975 fleet realignment, most DLGs and DLGNs were reclassified as CGs and CGNs, 30 June 1975. However, DLG 6–15 became DDG 37–46. 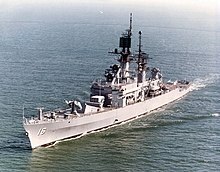 DL-1 through DL-5 had been decommissioned prior to this time; DLG-6 Farragut through DLG-15 Preble became DDG-37 through DDG-46. DLG-16 Leahy through DLGN-40 Mississippi became CG-16 through CGN-40. The guided missile destroyer sequence has three irregularities: four DDGs are numbered as if they were Destroyers in the main sequence (DDG-993, -994, -995 and -996), two were redesignated as guided missile cruisers (CG) (DDG-47 and DDG-48), and two numbers were skipped (DDG-49 and DDG-50). The Zumwalt class picks up at DDG-1000. (DD-850) Joseph P. Kennedy Jr.
^ Mann, Raymond A. (22 June 2015). "Bainbridge II (Torpedo-boat Destroyer No. 1)". Dictionary of American Naval Fighting Ships. Naval History and Heritage Command. Retrieved 27 December 2018. ^ Mann, Raymond A. (23 June 2015). 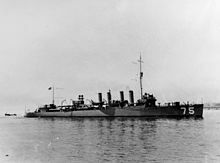 "Barry I (DD-2)". Dictionary of American Naval Fighting Ships. Naval History and Heritage Command. Retrieved 10 April 2019.